Robots have landed on an asteroid! Two tiny rovers have landed on an asteroid. The Japan Aerospace Exploration Agency (Jaxa), have landed two robots on the pristine asteroid Ryugu. This asteroid has been unchanged since the formation of the Galaxy! Jaxa’s spacecraft, Hayabusa 2, arrived to orbit the asteroid a few days ago to find the perfect landing spot for the two robots. Having landed safely they’ve already phoned home to say they’ve arrived, and have sent some photos too! Although engineers with the agency deployed the robots early Friday, JAXA waited until Saturday to confirm the success of the operation. Part of their mission will be to collect samples from just below the surface. 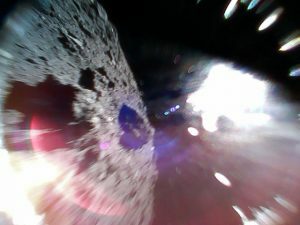 Could it be that the seeds of life on earth were sown by an asteroid like Ryugu? We’ll find out when they come home with their souvenirs. Hayabusa 2 was launched in December 2014 and is planned to return with the samples to Earth by then end of 2020. The agency still has two more deployments yet to accomplish before it can rest easy: Hayabusa2 is scheduled to deploy a larger rover called MASCOT in October and another tiny hopper next year. And of course, the main spacecraft has a host of other tasks to accomplish during its stay at Ryugu.